Getting CEIAG events organised, planned and running is no mean feat. You’ve done all of the prep work, you’ve booked the guests months in advance, managed to find a free room and then held off other members of staff trying to see if they can pinch it at the last-minute, you’ve reserved a parking space, smoothed things over with the lesson teachers that will have to supervise pupils a little over excited that something different is happening and then, the time arrives. Your Careers event is finally taking place. "@DYWDundee: S1 @stpaulsdundee are working with @LifeSkills_Ed this morning! #MathsWeekScotland pic.twitter.com/4zSSuqtRCi" What a morning! Add your own examples in the comments, none of us have been immune to the odd sour face messing up a photo of a great CEIAG event. Once, on a trip to a Russell Group University, I had a Year 10 flat-out refuse to take part in the group photo at the end of the day and went and stood by the car. The rest of group soon followed which meant I had a full on strike on my hands and had no photo for an expectant Headteacher looking for a good news story when we got back. I hope you enjoy your start to the new school year and are planning lots of exciting CEIAG events for teenagers to look nonplussed in. Every summer, the news cycle shines its brief gaze on the exam results of our nation’s youth and those you wish to promote their specific routes for young people attempt to gain PR traction usually by doing down the other pathways on offer. This summer I found it noticeable the extent articles and headlines blamed poor careers advice specifically in relation for a perceived lack of interest or knowledge in young people about apprenticeships. Elsewhere, Labour MP Frank Field was writing in the TES that A Level students had “been sold a pup” by schools and advisers due to the increasing rates of apprentice pay progression and employment opportunities compared to the weakening graduate labour market. The Managing Director of the NOCN, Graham Hastings-Evans, was also in the TES, claiming that it was “not too late” for students let down by poor careers advice to still apply for vocational and apprenticeship routes. And finally, the new Apprenticeships and Skills Minister, Anne Milton, took the opportunity in The Telegraph to promote the route and the Government’s work on the Skills Plan. 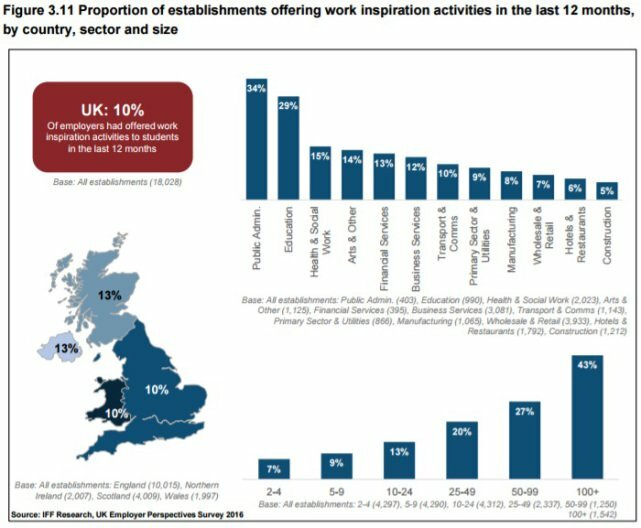 All of this attention is welcome for promoting the full variety of routes on offer to young people but, in their haste to do down careers advice as the reason that large numbers of young people are still following traditional paths the writers are conveniently forgetting a number of facts. Using the above data from the GOV.UK FE Data Library we can see that there have only been 3908 Higher Apprenticeship vacancies advertises in the whole 17/18 year to date, 3810 in 15/16 and 2870 in 14/15. So Apprenticeship provision at this level is growing but compare this to the numbers of students transitioning from Level 3 into traditional Higher Education routes. For the 2017 application cycle, just from England the total of 18 & 19 year olds applying for Higher Education was 319,100. The number of actual live Higher Apprenticeship vacancies in June 2017 when these young people were finishing their education courses or gap years and becoming available to the labour market? 590. To suggest that young people should take the apprenticeship route to protect against the waning wage benefit of graduate salaries is blindly ignoring the biggest hurdle facing those young people. There are nowhere near enough apprenticeship opportunities at that level for them to pursue. 16-18 year olds are by the far the largest age group to register to be able to apply for Apprenticeship vacancies. 254,250 have registered in the year to date so far well on the way to the 280,200 who signed up in 15/16. This age group has, so far this year, gone on to make 939,630 applications. 5. We know that Apprenticeship employers favour hiring older applicants. that they were immature and unreliable. not feel they could afford this. To recap, over a quarter of a millon 16-18 year olds are making over 900,000 applications, going up against 262,970 other 18+ applicants for 169, 290 apprenticeship vacancies. Let’s go back to those survey figures from the ECA, using the 2016 Schools, Pupils and their Characteristics national tables data we can see that there were 1,549,000 15-18 year olds in English schools last academic year. 8% of this figure is 123,920 pupils that self reported that they were being advised to attempt to secure an apprenticeship. The total number of apprenticeships advertised so far this year is 169,298, so, in reality, the pipeline of young people being advised to take this route is proportionate to the number of vacancies on offer. And that is the work that takes time, qualified staff and funded resources all of which are much more difficult to understand, lobby for or support than just taking the easy option of bashing careers advice for not giving out information.